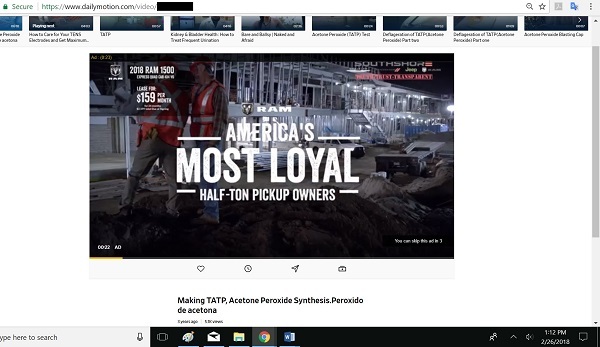 Advertisements from many well-known companies were found to be playing alongside a bomb-making video on the French web streaming platform, Dailymotion. Content reviewers at Dailymotion have been aware of the existence of the video since February 14, but have refused to remove the video in question, or remove accompanying advertisements from major corporations and organizations such as Merck Pharmaceuticals, Timberland, Dodge, and the Japan National Tourism Organization. Dailymotion’s failure to act illustrates both a lack of concern towards public safety as well as the reputations of their advertisers. The bomb-making video on Dailymotion has been linked to five pro-ISIS Telegram channels that encourage terrorist attacks. Three of the five Telegram channels have specifically encouraged attacks in Europe, and have regularly posted content in French, Swedish, and English. CEP researchers first located the video on Dailymotion on February 14 and alerted the streaming service via the “report” button, but it appears that no action was taken. CEP researchers again reported the video on February 23, but the clip and the ads before it, have not been removed. As of February 27, the video has been online for more than 3 years and has amassed more than 5,000 views. There are advertisements for at least 15 entities accompanying the video, including: Merck Pharmaceuticals, Dodge, Japan National Tourism Organization, Timberland, The Burlington Coat Factory, Bridgestone Tires, Onion Labs, HyreCar, Underlined, College for Creative Studies, Garmin Watches, Cat’s Pride, PolicyEd, South Nassau Communities Hospital, and the King Salman Humanitarian Aid and Relief Centre. 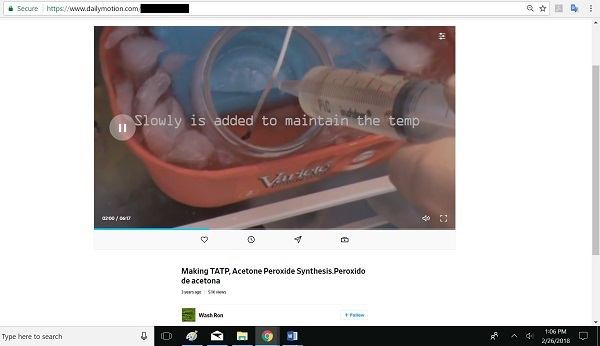 The bomb-making instructional video on Dailymotion falsely claims to be a documentary, and flagrantly offers detailed steps for synthesizing the deadly explosive TATP. The substance can be made at home using legally obtainable materials. TATP has been used to deadly effect in several terrorist attacks over the years, most recently in the November 2015 Paris attacks, the March 2016 Brussels bombings, and the May 2017 Manchester Arena bombing, as well as in several additional close calls that were either prevented or halted. The UK based Times reported that Salman Abedi, the Manchester bomber, used video streaming platforms to assist in building his own TATP bomb that killed 22 people and wounded more than 500. This is not the first time Dailymotion has paired advertisements with troubling content. In 2014 Mediaite reported that violent terrorist videos were being monetized by the platform. CEP also contacted several companies in October 2017 because their ads were also placed before ISIS videos on Dailymotion. It seems that despite the heightened atmosphere regarding branding, videos promoting terrorism, and violence, the problem persists. 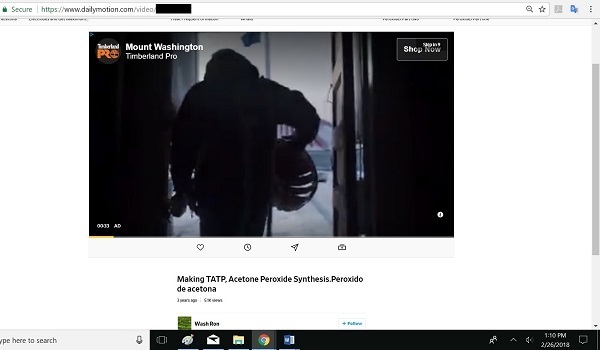 Advertisers should ask themselves if they want their products and services appearing alongside videos that provide the viewer with the knowledge necessary to commit mass murders. Similarly, video streaming companies should consider the public safety concerns that bomb-making videos pose, and those same companies should—at the very minimum—evaluate the risk that these videos pose to their reputations and to their bottom line. CEP hopes that Dailymotion will act to remove this video and all other bomb-making videos from their platform.